HONG KONG—Embattled Hong Kong Chief Executive Leung Chun-ying is being dealt another blow, as a secret document revealed he had pocketed millions in secret payoffs from UGL, an Australian engineering company. The controversy broke into the papers just two days before members of Leung’s administration are to sit down and negotiate with student leaders of democracy protests in Hong Kong. Citing a secret contract dated Dec. 2, 2011, the Sydney Morning Herald reported that UGL agreed to pay 4 million pounds (US$6.5 million) in two installments, in 2012 and 2013, after the company agreed to purchase the British property service firm DTZ holdings, for which Leung served as director and chairman of its Asia-Pacific operations before resigning on Nov. 24, 2011. 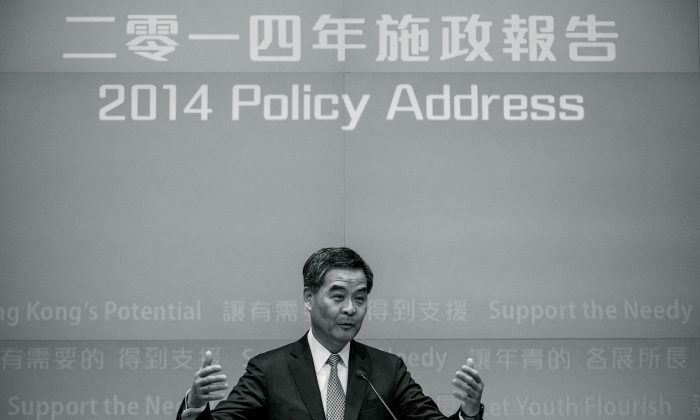 Four days later, on Nov. 28, Leung announced he was running for the chief executive of Hong Kong. And Leung won the election on Mar. 25, 2012. Leung received the money when he was chief executive. DTZ company was insolvent at the time of the sales, and while Leung received about 5 percent of the purchase price, unsecured creditors and shareholders of DTZ got nothing. In response to the accusation of wrongdoing, the Office of the chief executive issued a statement saying that the payment Leung received was related to service he had provided when he was still with DTZ, and at that time, he was neither a public official nor chief executive. Based on the wording, the payment appeared not to be limited to service Leung had provided before his resignation from the company. Politicians and citizens in Hong Kong have reacted with outrage. Claudia Mo, a legislator from the Civic Party, said that it was obvious that Leung was getting paid for his future services, and she was contemplating impeaching Leung in the legislature, reported Chinese-language website DWnews. Frederick Fung, a legislator from the Hong Kong Association for Democracy and People’s Livelihood, echoed the call for impeachment. “This is a serious conflict of interest, and Leung didn’t declare it while pocketing the money. We, the people of Hong Kong, cannot accept such corruption,” said Ho. Sin Chung-kai, a legislator from the Democratic Party, said he would use the powers and privileges of the Legislative Council and set up a special committee to investigate Leung and ask him to step down, Apple Daily reported.